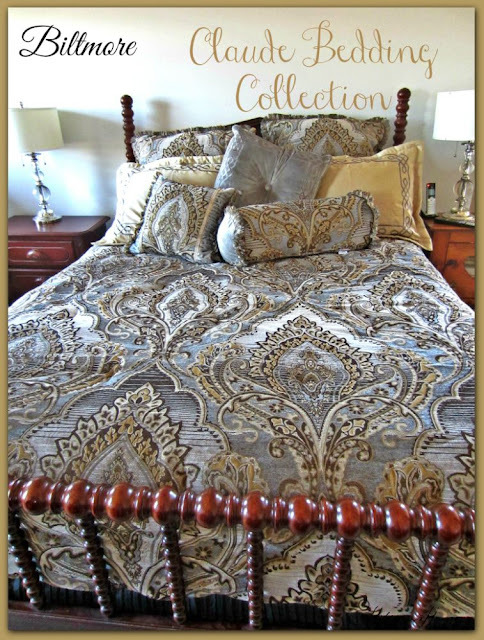 Today I'm sharing a new Winter Bedding Collection. We put this on right after the painting was done. We kept the Christmas quilt on the bed for way to long but knew it was thin and washable should paint happen to find it's way on it. It didn't though the painters were pretty good about that. 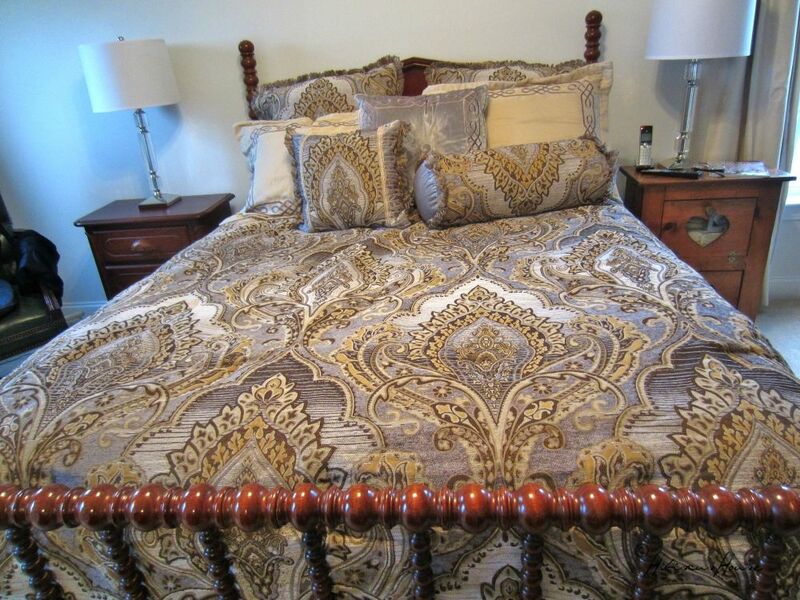 Yes, I did buy a comforter that has a little color to it, even though it is understated. I like the fact that the colors change with the lighting. Well I'll just put the description below for you to read. 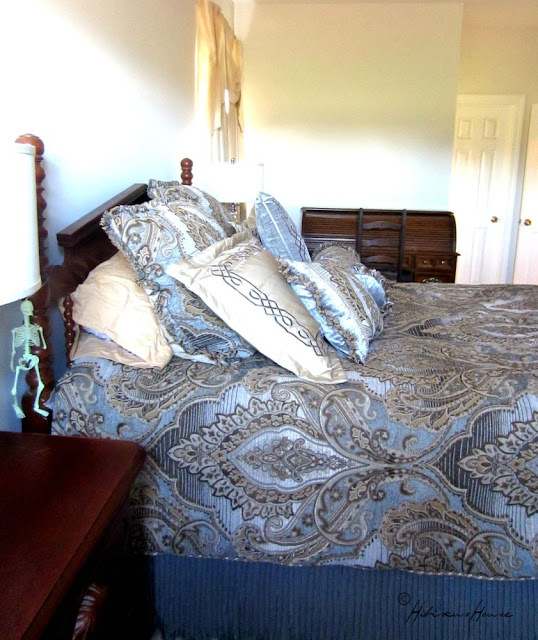 Catie gave Chuck the skeleton hanging on the bed post one Halloween. It lights up in the dark. She looks for that thing every time she comes home too buddy. 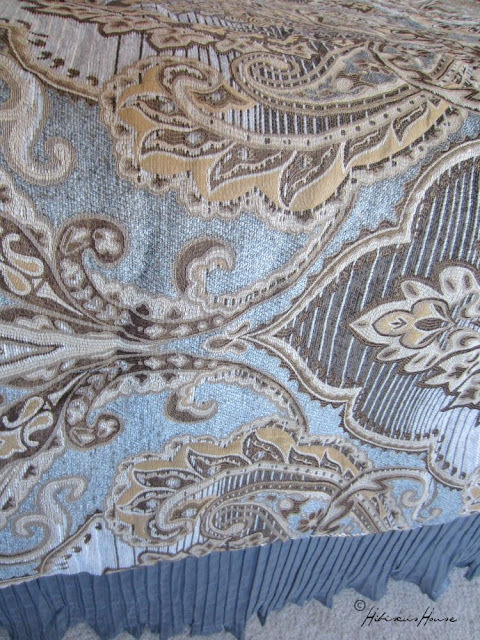 This gorgeous, chenille, grand scale design will instantly add flair to your home oasis, boasting shades of platinum, blue-gray, and charcoal intertwined with ivory and gold. The Claude Room in Biltmore House was a striking bedroom named for the French Painter Claude Gellee (ca. 1605-1682), also known as Claude Lorrain after the province in which he was born. He was one of George Vanderbilt's favorite artists; during the Vanderbilts' 1898 European honeymoon, Mr. Vanderbilt visited several collections of Lorrain's work. Lorrain was considered to be one of the greatest landscape painters of all time. 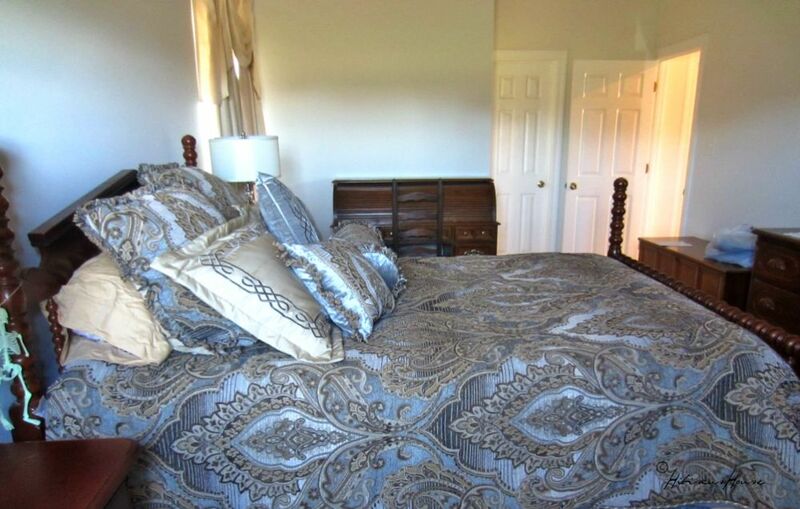 The striking wallpaper found in the Claude Room was the inspiration for this compelling bed ensemble. I like the fact that the colors change from gray to blue depending on the lighting. The Chenille is rather rough but the look is opulent! 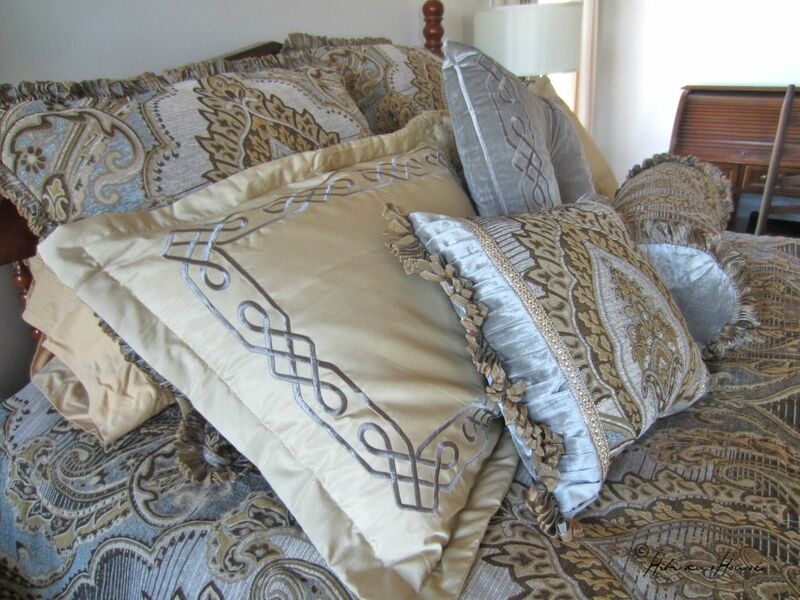 The comforter has a very beautiful soft lining which makes up for the outer shell. Did I mention that Chuck really likes this set! He has been so cute enjoying the new paint job, his favorite of course is the blue porch ceiling. When he saw this set he said, "You really are going all out with the Charleston and Biltmore look!" We spent our honeymoon in Charleston and we love it there! He and I went on his mother's honeymoon, (yes I said that on his mother's honeymoon) to Biltmore which of course we love! Can you see how blue this looks? Now within an hour it could look medium grey. 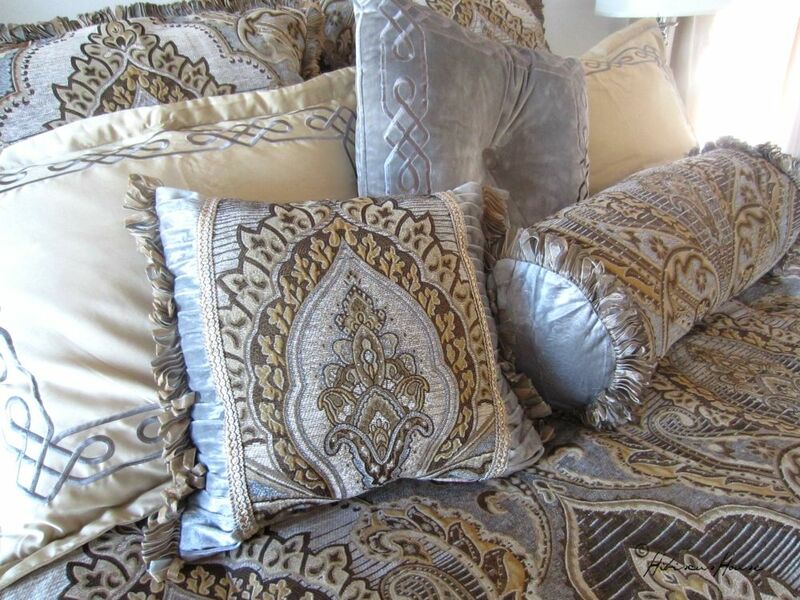 I like the assortment of pillows and shams. Ignore the blank walls I'm contemplating what to hang in the room now. I need artwork that will blend with all decor for all seasons. The pleated bedskirt falls so beautifully and I love the fact that it touches the floor on both sides! See the gray in the picture above? I thought I'd better share this set before I take it off the bed and replace it with a Spring/Summer set. 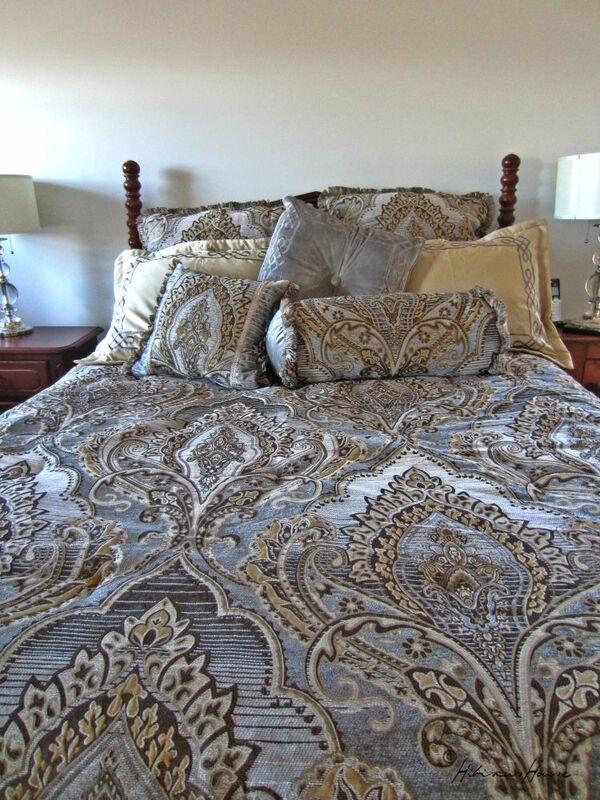 This comforter is very warm yet lightweight. I have slept extremely well under it and that surprises me because I usually like it to be a little cool when I sleep. We've really enjoyed this set with the cold weather we've had in the last week. 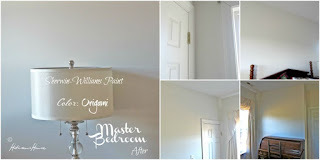 The paint is dry and we're really enjoying the room even more. I do hate to put holes in a wall! The set is Dry Clean Only and that I don't like that very much. I do enjoy sleeping underneath it so guess I have to make doubly sure the face is clean of makeup. Speaking of dry cleaning I had to do a little of that with the draperies in this room. I know they are getting old and dated but I still like them. 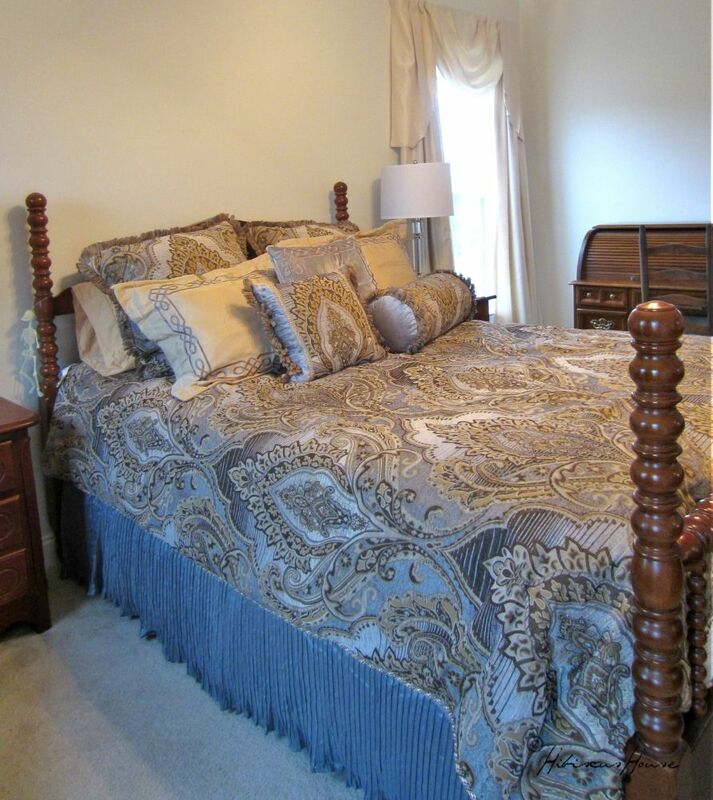 We have room darkening liners behind them in this room because when you have a sometime day sleeper it is a must. One advantage to that is in the Summer the room is cooler and in the Winter the room stays warmer. Did I tell you it is very expensive to dry clean draperies? It is and so much so that you may want to reconsider and put the money towards purchasing new ones. You May Not Have to Dry Clean the Draperies! I hope you enjoyed the post and will be back soon with the Spring Bedding. I love the colors of the bedding. It looks so beautiful and what wonderful details! Love the bedding-it is the same colors I have in our master bedroom. 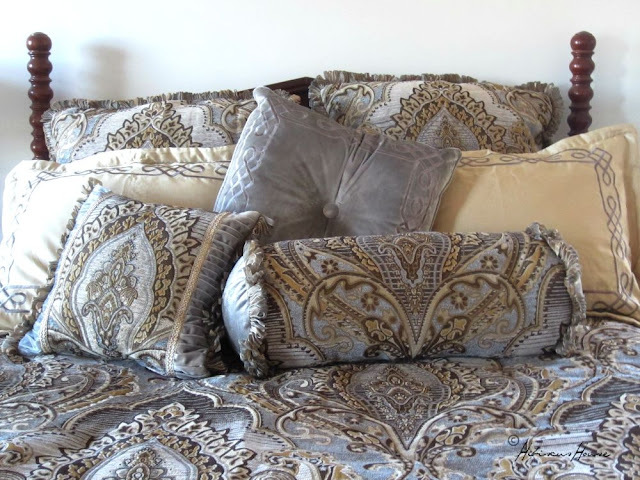 Gorgeous bed set. 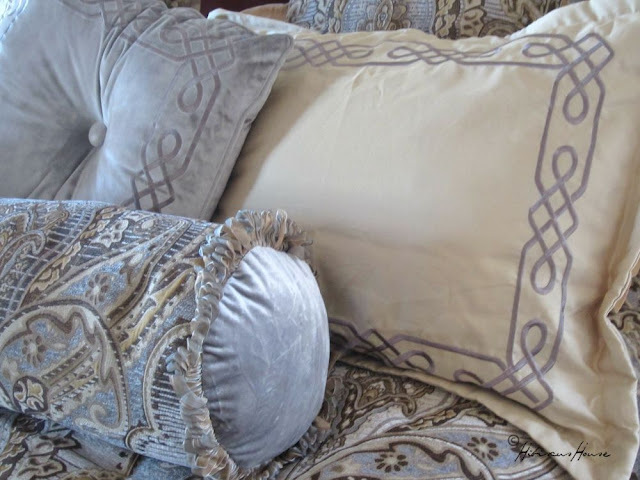 I love the fringes on the side of the comforter, great job!